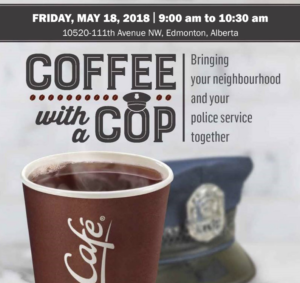 Join your neighbours and Edmonton Police Service Officers for coffee and conversation. No agendas or speeches, just a chance to ask questions, voice concerns and get to know the officers in your neighbourhood. Includes a free small coffee, courtesy of McDonald’s.